Looking for classic gentleman's pocket knife in a compact design? Our single blade lockback pocket knife features a single 3" 440C stainless steel blade for a traditional look and feel. 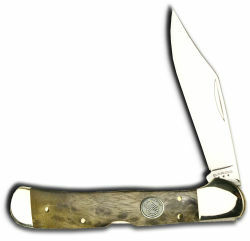 The 4 1/8" maple burl wood handle has polished nickel silver bolsters, inset SARGE medallion and brass liners. Lockback knife comes with a silk polishing bag.